Secure, efficient communication between doctors and staff is key to reliable patient care. For Groves Community Hospice, every situation involving patients requires rapid response; this poses a particular challenge, as more than 80 percent of the hospice staff work in the field. 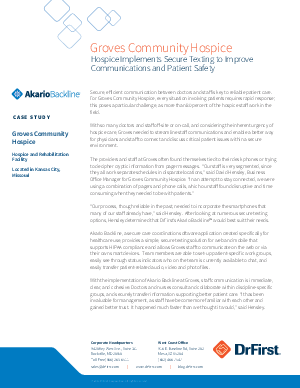 With so many doctors and staff off-site or on-call, learn how Groves was able to streamline staff communications, enabling physicians and staff to more efficiently connect and discuss critical patient issues within a secure environment.